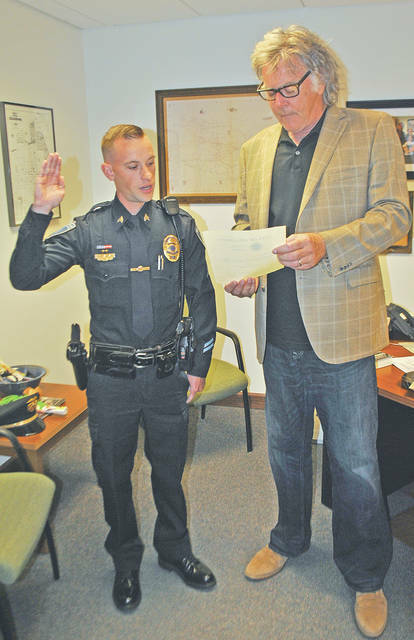 Adam Day and Jacquelyn Johnson were sworn in by Hillsboro Mayor Drew Hastings to new positions Wednesday with the Hillsboro Police Department. Day was promoted to sergeant. He will have been with the HPD for four years in August and worked with the Sabina Police Department for six years before that. Johnson previously served 20 years as a dispatcher with the Greenfield Police Department. 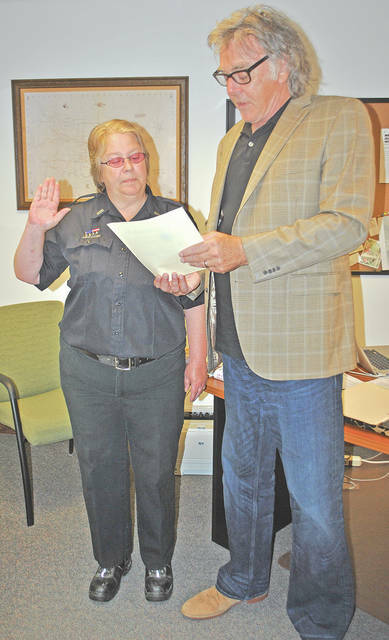 She will start in her new position as a telecommunications 911 operator, or dispatcher, with the HPD on July 16.
https://www.timesgazette.com/wp-content/uploads/sites/33/2018/06/web1_HPD-Day-swearing-pic.jpgAdam Day and Jacquelyn Johnson were sworn in by Hillsboro Mayor Drew Hastings to new positions Wednesday with the Hillsboro Police Department. Day was promoted to sergeant. He will have been with the HPD for four years in August and worked with the Sabina Police Department for six years before that. Johnson previously served 20 years as a dispatcher with the Greenfield Police Department. She will start in her new position as a telecommunications 911 operator, or dispatcher, with the HPD on July 16.